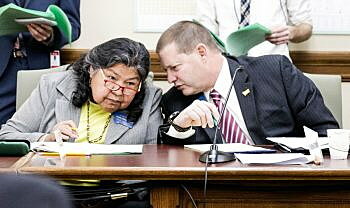 (UM Community News Service) A loose-knit, ever-evolving group of Republican legislators is making waves and causing headaches in the 66th Montana Legislature. It’s not a traditional caucus by any means: No barriers to entry, no specified leaders, nor a roster. Simply put, it’s a group of legislators who meet informally and talk about issues. They’ve branded themselves as independent, realistic thinkers in an environment that often feels deeply divided along party lines. One such lawmaker is Rep. Llew Jones, R-Conrad, who used the phrase “radically transparent” to describe the group’s sharing of ideas with anyone who’s interested. That also means creating an atmosphere in which people are willing to offer up new concepts, Jones said. “You can’t get people to speak freely and engage in the sausage-making if they’re not comfortable,” Jones said. Solutions caucus members have been planning for this session for months now, Jones said. Members call each other on the phone, eat meals together or gather casually to talk and debate. Jones said freshman legislators are encouraged to ask members for help on policy questions. He estimated the caucus to be comprised of about 25 representatives and 10 senators. In the first week, this group proved to have significant pull. The debate over the rules governing the House of Representatives was the first big fight of the session. Democrats wanted the rules amended to allow for a simple majority, 51 votes, to “blast” a bill stalled in committee to the full House for debate. A previous rule had dictated a 60-vote majority for a blast motion. In the weeks leading up to this session, it looked like Democrats had struck a deal with moderate Republicans to change the rules. However, the night before the session began, moderates and conservatives found a compromise: a 58-vote majority for blast motions. The bill passed 88-to-12 on day four. Great Falls Republican Rep. Ed Buttrey, another key member of the solutions caucus and also the House Rules Committee, said these compromises are important to keep business moving. “We come up with some dang good stuff. We just saw that in the rules, and we solve problems because we’ve allowed people have different viewpoints,” Buttrey said. Some legislators, however, have mixed feelings about compromises like these. Rep. Derek Skees, R-Kalispell, said if a lawmaker is voted into office as Republican on the ballot, he or she should vote with party leadership. Skees, who holds a party leadership position as a majority whip, said he worries that when he goes home and talks with constituents, they’ll question the integrity of the Republican party if legislators break on votes. “It makes a component of our service a lie to our constituents,” Skees said. Skees said national GOP guidelines and state party leadership define how Republicans should vote. There is a little leniency — he said the party should agree and vote together on 80 percent of issues. He said he hopes Republicans can unify this session. “I would suggest that’s the way that a caucus should behave,” Skees said. Speaker of the House, Greg Hertz, R-Polson, declined to be interviewed for this story and would only say that conservatives have a “unified Republican caucus.” The party has held control of Montana’s lawmaking body for the past four sessions, since 2011. Republican Rep. Nancy Ballance from Hamilton is a senior legislator and chair of the Appropriations Committee. She’s a newer member to the solutions caucus, after having sided with conservatives in 2015 and voting against the bill that expanded Medicaid. “In fact, one of the basic things that draws people to Republicanism is that independent thinking,” Ballance said. Past sessions have shown a clear division in the conservative party, and moderates and Democrats working together is not new. In 2013, Skees had served a term in the House and suggested at a GOP state convention the party should rate candidates on how well they uphold GOP principles, and cut off support for those who don’t meet standards. The next election cycle, a number of conservatives targeted some moderate Republicans in opposition, including Jones. At the time, Jones called moderates in his party “responsible Republicans.” He was nevertheless re-elected. In 2015, Buttrey carried the Medicaid expansion bill with bipartisan support in the House: All 41 Democrats and 13 Republicans voted in favor of the state-federal partnership program. Democratic Gov. Steve Bullock commended the effort while Republican leaders worked throughout the session to oppose the measure. The rift appeared to close temporarily in 2017 when Republicans united during the special session to find consensus on a budget. However, with Montana Medicaid expansion’s expiration date nearing, it’s being billed by both sides as one of this year’s top issues and it could again divide the party. 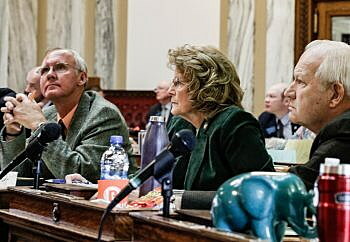 With roughly 95,000 Montanans enrolled in the program, lawmakers have polarized concerns. Republicans have said Montana cannot afford to subsidize program enrollment this size in the future, and that the program needs more recipient oversight. Democrats and Gov. Bullock are touting the economic and social benefits of Medicaid, and announced their own bill last week to re-authorize expansion called the Keep Montana Healthy Act. Democrats are in the minority and know they need to reach across the aisle to pass expansion, which Minority House Leader Casey Schreiner, D-Great Falls, said is a paramount goal for the party. “We know everything we want to pass has to have bipartisan support,” Schreiner said. The most winning method for Democrats to find a majority in the past has been to team up with moderate Republicans, many of whom make up the solutions caucus. 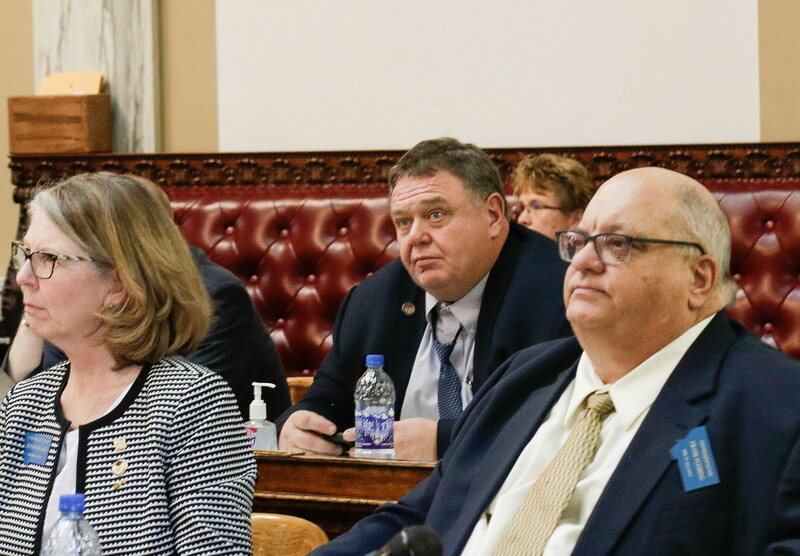 Senate Minority Leader Jon Sesso, D-Butte, and House Minority Leader Casey Schreiner, D-Great Falls, oppose to the use of the word “solutions” by the Republican group, saying it’s what Democrats strive for, as well. But in the grand scheme of things, Sesso said the name issue isn’t a big deal. “I have joined hands with the solutions caucus to forge solutions, to address problems constituents bring to us,” Sesso said. Members of the moderate group made clear they aren’t trying to alienate themselves from their party, but that the goal is to engage in conversations with all who are interested in exploring compromise and listening to a variety of viewpoints. Shaylee Ragar is a reporter with the UM Community News Service, a partnership of the University of Montana School of Journalism and the Montana Newspaper Association. Shaylee can be reached at shaylee.ragar@umontana.edu.